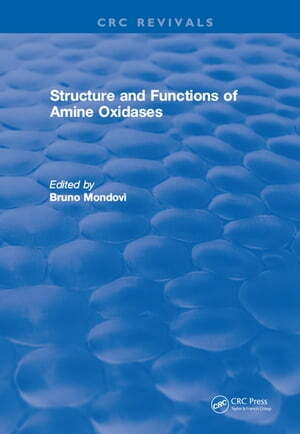 Collins Booksellers - Structure and Functions of Amine Oxidases by Mondovi, 9781351093859. Buy this book online. A good portion of this book has been devoted to the copper-dependent enzymes, these being the more numerous. The chapter dealing with serum amine oxidases also focuses attention on their catalytic mechanism, as these enzymes have been studied in greater depth.As the presentation of topics whose experimental basis is rapidly developing is likely to stimulate the reader?s interest, many bibliographic references have been included.Readers could find this book poor, as far as many topics are dealt with in a relatively little space, but we believe it essential to trace the background of our present knowledge in the field of amine oxidases, stressing the future outlook of research on these enzymes, for they are becoming more and more important in general and medical biochemistry.